"A Girl's Best Friend" redirects here. For single by rapper Jay-Z, see Girl's Best Friend. K-9 and Company is a one-episode television pilot, for a proposed 1981 television spin-off of the British science fiction television series Doctor Who . It features former series regulars Sarah Jane Smith, an investigative journalist played by Elisabeth Sladen, and K9, a robotic dog voiced by John Leeson. Both characters had been companions of the Fourth Doctor, but they had not appeared together before. The single episode, "A Girl's Best Friend", was broadcast by BBC1 as a Christmas special on 28 December 1981, but was not taken up for a continuing series. A television pilot is a standalone episode of a television series that is used to sell the show to a television network. At the time of its creation, the pilot is meant to be the testing ground to gauge whether a series will be successful; it is therefore a test episode for the intended television series, an early step in the series development, much like pilot studies serve as precursors to the start of larger activity. In the case of a successful television series, the pilot is commonly the very first episode that is aired of the particular series under its own name; the episode that gets the series "off the ground". A "back door pilot" is an episode of an existing successful series, featuring future tie-in characters of an up-and-coming television series or film. Its purpose is to introduce the characters to an audience before the creators decide on whether or not they intend to pursue a spin-off series with those characters. "A Girl's Best Friend" is set in the fictional English village of Moreton Harwood in 1981. In the programme, Sarah and K9 investigate the disappearance of Brendan Richards (Ian Sears), the ward of Sarah's Aunt Lavinia (Mary Wimbush), in the wake of increasing reports of witchcraft. Mary Wimbush was an English actress whose career spanned 60 years. Active across film, television, theatre and radio, she was nominated for the BAFTA Award for Best Supporting Actress for the 1969 film Oh! What a Lovely War. Her television credits included Poldark (1975–77), Jeeves and Wooster (1990–92), and Century Falls (1993). She was perhaps best known for her role as Julia Pargetter in BBC Radio 4's popular soap opera The Archers, a part she played from 1992 until her death. Under a different production team, the overall concept of a Sarah Jane and K9 series did eventually come to fruition: The Sarah Jane Adventures (2007–2011), featuring both of these key characters and actors (though K9 and Leeson only appear in some episodes). The programme has its roots firmly in the desire of Doctor Who producer John Nathan-Turner to get Elisabeth Sladen back into the TARDIS. He had wanted her to have the contract eventually awarded to Janet Fielding in late 1980. John Nathan-Turner's preferred plan for the transition from Baker to Davison was to have Sarah Jane be along for the ride from Logopolis to the second story of series 19. However, Sladen had no interest in returning simply to reprise a role and function identical to the one she had left years before. John Nathan-Turner, born John Turner, was the ninth producer of the long-running BBC science fiction series Doctor Who. He was also the final producer of the series' first run on television. He produced the series from 1980 until it was cancelled in 1989. He finished the role having become the longest-serving Doctor Who producer and cast Peter Davison, Colin Baker and Sylvester McCoy as the Fifth, Sixth and Seventh Doctors, respectively. Nathan-Turner died of alcoholism-related liver failure at the age of 54. Elisabeth Clara Heath-Sladen was an English actress best known for her role as Sarah Jane Smith in the British television series Doctor Who. She was a regular cast member from 1973 to 1976, alongside both Jon Pertwee and Tom Baker, and reprised the role many times in subsequent decades, both on Doctor Who and its spin-offs, K-9 and Company and The Sarah Jane Adventures. 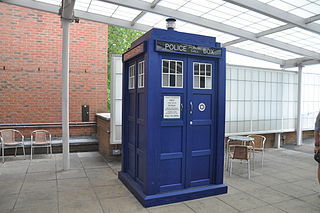 The TARDIS is a fictional time machine and spacecraft that appears in the British science fiction television series Doctor Who and its various spin-offs. Meanwhile, Nathan-Turner was trying to figure out what to do about K9. The robot dog was very popular among children but was difficult to deal with technically and Nathan-Turner felt that it made the TARDIS crew almost overwhelmingly formidable. He decided that a child-orientated spin-off series with K9 might be just the thing. However, such a series would require a human as the lead, and his prime candidate for this role was Sladen. He pitched the part to the actress as a departure from what she had previously done: she would be returning as Sarah Jane Smith, but she would do so as the heroine and not just a sidekick. This offer Sladen accepted. Sarah Jane Smith visits her Aunt Lavinia, who was occasionally mentioned but never seen in Doctor Who. When she arrives at her aunt's house, though, she finds that her learned relative has left early for a lecture tour in America, Christmas notwithstanding. Sarah is thus left disappointed by the prospect of another holiday without family. Lavinia's ward, Brendan Richards, breaks her moment of reflection on her aunt's sudden disappearance. After picking him up from the railway station, they return to the house and discover a large crate that has been waiting for Sarah for a number of years. When they open it, they discover a mechanical dog named K9. Upon activation, it tells Sarah that it is a gift from the Doctor. Brendan's curiosity about K9 is matched only by Sarah's renewed concern over Lavinia's absence. They thus split up and follow their new-found obsessions. Sarah goes into town to question the locals, and Brendan stays behind to test the capabilities of Sarah's new "pet". In town, Sarah discovers that Lavinia has become disliked by some because of her blunt letters to the local newspaper editors about a growing practice of witchcraft in the area. Brendan, meanwhile, is attacked while using K9 to analyse soil samples in Lavinia's garden. His attackers, George Tracey and his son, Peter, are tied into the local coven. George Tracey flees before Brendan can get a good look at him, however K9 uses his laser gun to stun Peter before setting off in pursuit of George. Peter is pinioned and interrogated by Brendan, but makes his escape when Brendan goes outside to investigate a crashing sound which turns out to be the accidental destruction of a greenhouse by K9 in his pursuit of the elder Tracey. A coven usually refers to a group or gathering of witches. The word "coven" remained largely unused in English until 1921 when Margaret Murray promoted the idea, that all witches across Europe met in groups of thirteen which they called "covens". Since Tracey is actually Lavinia's gardener, he is naturally called in the next morning to investigate the damage K9's pursuit of him caused to the greenhouse. After Brendan attempts to brag about the pH balance of the soil, Tracey sharply comments that gardening is more about respect for nature than scientific theory. Otherwise, though, he doesn't betray his more sinister intent towards Brendan. Later that night, he sends his son out to kidnap the sleeping Brendan from the house. This time, Brendan's attacker is successful, stealing him out from under Sarah, who is elsewhere in the house, reading up on the local practice of witchcraft. Sarah is now increasingly suspicious of Tracey, believing he would have the opportunity to commit the crime, even if she can't yet put her finger on the motive. She therefore finds a way to hide K9 in Tracey's house. K9 quietly monitors the household, until he eventually listens in on a conversation that implicates Tracey as a member of a coven. He also discovers that Tracey intends to kill Brendan in an act of ritual murder. When Tracey leaves his cottage, Sarah is able to retrieve K9, who alerts his new mistress to the impending crime. She has no way to enlist the aid of the local police or, really anyone else in the town, because she can't substantiate her claim of overhearing the conversation without also then having to explain who and what the anachronistic K9 actually is. Realising that she and K9 are effectively on their own, she tries to figure out how to stop the sacrifice. Her first order of business is determining the when of it. Using Lavinia's books on witchcraft, she and K9 deduce it must occur at midnight on the winter solstice, now just a few short hours away. The where of it is more elusive, however, causing the duo to drive around the shire looking at all the churches. As the last few minutes before midnight tick away, they finally realise that there's an abandoned chapel on Lavinia's property. Rushing home, K9 and Sarah are briefly upset at missing something that was right under their noses all along. They arrive just in time for K9 to use his blaster to stop the coven's Priest and Priestess from plunging a knife into Brendan's chest. Now stunned, the group's ringleaders are easily apprehended by the police. Finally able to celebrate Christmas, Sarah receives a call from her Aunt Lavinia. She's surprised that Sarah was worried about her, since she left instructions for her business partner to send Sarah a cable. As he turned out to be the High Priest of the coven, Sarah merely laughs and tells her aunt that she has a story to tell her about why that message never reached her. Meanwhile, K9 tries to connect with the human holiday in his own way, teaching himself to sing "We Wish You a Merry Christmas". Bill Fraser previously appeared with Tom Baker and K9 Mark II in the Doctor Who story Meglos . Many Doctor Who fans remember A Girl's Best Friend most clearly for its electronic theme music, composed by long-term Doctor Who enthusiast and record producer, Ian Levine, with his musical partner Fiachra Trench. Levine, who was also the unofficial continuity consultant for Doctor Who in the 1980s, said in an interview with Dreamwatch Bulletin that the music was intended to be an orchestral score, but was instead arranged directly from his electronic demonstration arrangement by Peter Howell (who also arranged the 1980s version of the Doctor Who theme music) without Levine's knowledge. The viewing figures for the pilot were strong, achieving a viewership of about 8.4 million Britons on its première. This meant that it attracted more viewers than the average episode of Doctor Who during John Nathan-Turner's era as producer. It was even more popular than the other seasonal special of the era, The Five Doctors, which posted a rating of 7.7. Only when one looks narrowly at Season 19 – the one which immediately followed the broadcast of K-9 and Company – can one find a period where sustained ratings in the parent show were higher than the ratings for this spin-off pilot. Despite these above-average ratings, the show did not go to series. The proximate cause for this was a changeover in channel controllers at BBC One. Bill Cotton, who had approved the pilot, vacated his position soon thereafter. He was replaced by Alan Hart, who simply disliked the idea and the resulting product. Further episodes were therefore not commissioned. The show was repeated once on BBC2 during the Christmas period of 1982. The pilot episode was novelised in the late 1980s as the last in the Target Books series called The Companions of Doctor Who. The story was released on video in the UK on 7 August 1995 as Doctor Who: K-9 and Company. It first appeared in the US in August 1998. Neither version is currently available. It was released on DVD on 16 June 2008 alongside The Invisible Enemy in the Doctor Who: K9 Tales (The Invisible Enemy / K9 And Company) box set. It was also released again in March of 2019 as part of the Series 18 Blu-Ray Box set. The pilot attracted 8.4 million viewers on its original broadcast. In Doctor Who Magazine's The Mighty 200 fans gave K-9 and Company 51.55% likeness. The title sequence came first in TV's Top 5 worst title sequences as part of David Walliams' Awfully Good TV. A novelisation of "A Girl's Best Friend" was released in October 1987 as the last of The Companions of Doctor Who series under the title K-9 and Company. The Time Warrior is the first serial of the 11th season of the British science fiction television series Doctor Who, which was first broadcast in four weekly parts on BBC1 from 15 December 1973 to 5 January 1974. The serial introduced Elisabeth Sladen as new companion Sarah Jane Smith. It also marked the debut of the Sontaran race. The serial also introduces the name of the Doctor's home planet, Gallifrey. K9, occasionally written K-9, is the name of several fictional robotic canines in the long-running British science fiction television series Doctor Who, first appearing in 1977. K9 has also been a central character in three of the series television spin-offs: the one-off K-9 and Company (1981), The Sarah Jane Adventures (2007–2011) and K9 (2009–2010). Although not originally intended to be a recurring character in the series, K9 was kept in the show following his first appearance because he was expected to be popular with younger audiences. There have been at least four separate K9 units in the series, with the first two being companions of the Fourth Doctor. Voice actor John Leeson has provided the character's voice in most of his appearances, except during Season 17 of Doctor Who, in which David Brierley temporarily did so. The character was created by Bob Baker and Dave Martin, to whom rights to the character still belong; consequently, Baker's spin-off series K9, which is not BBC-produced, cannot directly reference events or characters from Doctor Who, though it attempts to be a part of that continuity. The Hand of Fear is the second serial of the 14th season of the British science fiction television series Doctor Who, which was first broadcast in four weekly parts on BBC1 from 2 to 23 October 1976. The serial was the last regular appearance of Elisabeth Sladen in the role of Sarah Jane Smith in Doctor Who. Graeme Harper is a British television director. He is best known for his work on the science-fiction series Doctor Who, for which he is the only person to have directed episodes of both the original run (1963–89) and revived run (2005–) of the programme. Doctor Who Magazine has described him as "the longest-serving crew member on Doctor Who." "Army of Ghosts" is the twelfth and penultimate episode in the second series of the British science fiction television programme Doctor Who which was first broadcast on BBC One on 1 July 2006. It is the first episode of a two-part story; the concluding episode, "Doomsday", was first broadcast on 8 July. Outpost Gallifrey was a fan website for the British science fiction television series Doctor Who. It was active as a complete fan site from 1995 until 2007, then existing solely as a portal to the still-active parts of the site, including its news page and forums until July 31, 2009. Sarah Jane Smith: Ghost Town is a Big Finish Productions audio drama based on the long-running British science fiction television series Doctor Who. It stars Elisabeth Sladen reprising her role as Sarah Jane Smith. Sarah Jane Smith: Buried Secrets is a Big Finish Productions audio drama based on the long-running British science fiction television series Doctor Who. It stars Elisabeth Sladen reprising her role as Sarah Jane Smith. "Invasion of the Bane" is the first episode of the British science fiction television series The Sarah Jane Adventures, originally broadcast on 1 January 2007 as a holiday special. Since a full series of the show was commissioned before the script for the episode was written it is not a pilot, despite serving the introductory functions of one. The Temptation of Sarah Jane Smith is a story of The Sarah Jane Adventures which was broadcast on CBBC on 17 and 24 November 2008. It is the fifth serial of the second series. The Day of the Clown is the second story of Series 2 of The Sarah Jane Adventures The two-part serial was broadcast on 6 and 13 October 2008; "Part One" on the CBBC Channel at 5.15 p.m. on 6 October; "Part Two" on the CBBC Channel at 5.15 p.m. on 13 October. The Day of the Clown introduces main character Rani Chandra and her parents, Haresh and Gita Chandra, and they would stay for the rest of the series. The Wedding of Sarah Jane Smith is a two-part story of The Sarah Jane Adventures. It was first broadcast on BBC One on 29 and 30 October 2009. It is the third serial of the third series. It guest stars David Tennant as the Tenth Doctor, marking the first appearance of parent programme Doctor Who's main character in a spin-off show. Filmed after The End of Time, the episode includes the final scenes David Tennant recorded during his tenure as the Doctor. Sky Smith is a fictional character in the British children's science fiction television series The Sarah Jane Adventures, a spin-off of the long-running series Doctor Who, played by Sinead Michael. She appears as a regular in the show's fifth and final series, first appearing in Sky. She is a "Fleshkind" humanoid, bred by her mother Miss Myers as the perfect weapon in their fight against the robotic Metalkind. After her offensive powers are neutralised, Sarah Jane Smith adopts her as her daughter at the end of Sky. In the unfinished episode The Battle of Bannerman Road, it would have been revealed that Sky is the daughter of the Trickster. The episode was never finished or aired due to the sudden death of Elisabeth Sladen, and it is currently unknown what would have happened following the revelation. April Walker (1941) is a British actress, primarily for the BBC, best known for her regular appearances on the hit variety show The Two Ronnies, episodic guest roles on numerous other shows like Fawlty Towers and Dial M for Murder, and also for having been the first woman cast in the seminal role of Sarah Jane Smith for the series Doctor Who. ↑ "BBC – Doctor Who Classic Episode Guide – K9 and Company – Details" . Retrieved 13 December 2007. ↑ "Full cast and crew for K-9 and Company". Internet Movie Database. Retrieved 2 January 2008. ↑ Lyon, Shaun. "K-9 and Company". Outpost Gallifrey . Archived from the original on 17 June 2006. Retrieved 19 August 2006. ↑ Lyon, Shaun. "Doctor Who Episode Guide". Outpost Gallifrey . Archived from the original on 15 August 2006. Retrieved 19 August 2006. ↑ Lyon, Shaun. "The Five Doctors". Outpost Gallifrey . Archived from the original on 17 June 2006. Retrieved 19 August 2006. ↑ "Doctor Who: K9 and Company VHS". amazon.co.uk. Retrieved 1 July 2013. ↑ "Doctor Who: K9 Tales Box Set (Invisible Enemy/K9 and Co) DVD". amazon.co.uk. Retrieved 1 July 2013. ↑ "K9 & Company DVD". amazon.co.uk. Retrieved 1 July 2013. ↑ "K9 and Company: A Girl's Best Friend : BBC". BBC. 1 December 2012. Retrieved 1 July 2013.